A reminder that the pilgrimage in honour of St Margaret Clitherow and the Martyrs of York will take place next Saturday 30th April. Solemn Mass will be at 1.30pm at St Wilfrid's Church followed by the procession at 3pm and Benediction at 4pm. Every year, the Latin Mass Society organises a Pilgrimage to Walsingham. In recent years it has taken place over the August Bank Holiday weekend, and has been extended to become a walking pilgrimage starting at Ely and progressing to Walsingham over three days. This year, pilgrims will gather at Ely on the evening of Thursday 25th August and arrive at the Walsingham shrine at lunchtime on the Sunday in time for Mass at 2pm. 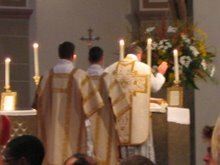 The Latin Mass Society is now taking bookings for the 2016 pilgrimage. Bookings can be made on line at the LMS website. Those wishing just to attend the Solemn Mass and procession on the Sunday can do so by travelling direct to Walsingham. Since parking near the Slipper Chapel can be difficult on a Bank Holiday weekend, plenty of time should be allowed. This may be of interest, particularly to people living in the northern part of the Diocese. For full details, please follow the enclosed link, which will take you to Fr. 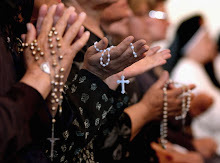 Simon Henry's blog, Offeribus Tibi Domine. You may need to copy and paste it into your own browser. The fifth annual pilgrimage in honour of St Margaret Clitherow and the Martyrs of York organised by the Latin Mass Society will take place in York on Saturday 30th April. It will begin at 1.30 pm with Solemn Mass at St Wilfrid's Church, which is close to the Minster. A procession, carrying a statue of Margaret Clitherow, through the streets of York, calling at the shrine in The Shambles and passing over Ouse Bridge, the place of her execution, will follow. The day will end back at St Wilfrid's Church with Benediction at about 4pm. A limited tea will be provided after Benediction in the upper room of St Wilfrid's Church. Those travelling by car are advised to use one of the Park and Ride services, as parking in central York is very difficult.